Your participation to the event will not only give you the chance to learn new things about the topics you are interested in & expand your social network, but also explore one of the most popular touristic destinations in Greece. The venue selected is the International Conference Center of the Mediterranean Agronomic Institute of Chania (MAICh). It is fully complied with the recent “Guidelines for Sustainable events” produced by the Interreg MED Community and is a powerful Mediterranean knowledge hub. 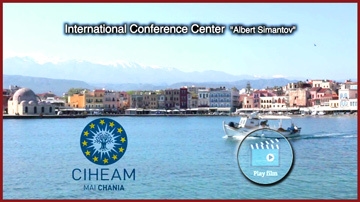 MAICh is part of the CIHEAM founded in 1962 and it is a conference center set with respect to the environment. It successfully covers events related to “greener” thematics, placing great emphasis on sustainability issues. It is specialized to accommodate Academic and Research Conferences, Seminars, Workshops, Summer Schools with a full range of integrated organizational support services. The CIHEAM is a Mediterranean Intergovernmental Organization devoted to the sustainable development of agriculture and fisheries, food and nutrition security and rural and coastal areas. It is composed of 13 member States and operates through its 4 Institutes based in Bari (Italy), Chania (Greece), Montpellier (France) and Zaragoza (Spain) and the Headquarters based in Paris. The CIHEAM collaborates with several international and regional organisations. The Conference Halls [web site] are all supported by the latest audio-visual equipment, including video, overhead and slide projectors, large screens, simultaneous interpreting systems, video recorders etc.